Produced in Scotland by the best manufacturer of its kind, these plaques are sure to please. Available for most larger clans. Please note that since this are shipped from Scotland you will need to allow 4-6 weeks for delivery. 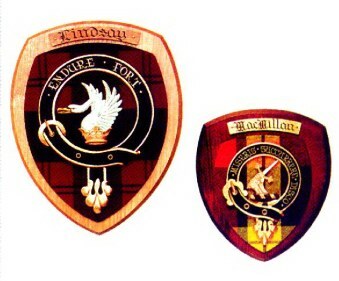 Scottish Clan Crest Wall Plaques. Mounted on a Rosewood or Oak plaque with mediun weight tartan fabric background and carved crest insignia, hand painted in full color. Sorry no color choice of plaque at this time. 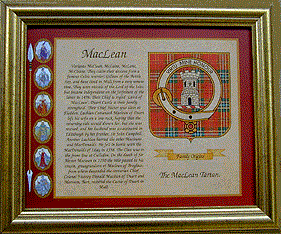 Tartan Heritage Scroll printed on heavyweight acid free 8"x10" fine paper with archival inks these full color prints include the Tartan, Clan Crest and a short history of each Scottish Clan . Framing and matting not included. Also available for Irish Families showing the County Tartan and Map of Ireland.